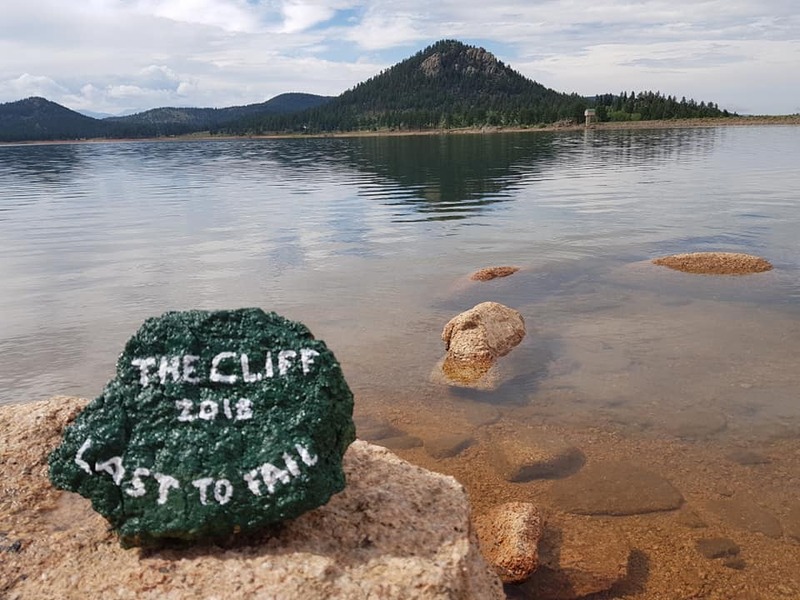 The Cliff Backyard Ultra is a unique individually supported stage-style marathon swimming competition. This swim offers a challenging swimming opportunity for long-distance swimmers. In this event, swimmers have the chance to test their swimming strength by completing a 1.5 Mile loop each hour, on the hour, until they no longer desire to continue. The last swimmer to complete a lap earns the title of "Last to Fail." 1 pm-5 pm: Check in and set up camp at Wellington Lake. 9:00 pm: Quiet hours at the lake. Swimmers must fully complete a race loop of 1.5 miles within every hour. Failure to start the next race at :59 on the hour means you have exited the race. Late starts are not allowed. Race directors have the sole discretion to determine if you were late to the start or not. Wetsuits are prohibited. You may only compete in a textile swim suit. Women may only wear a standard swim suit. Female suits may not cover the shoulder or continue to the knees. Men may wear a traditional Speedo cut suit, box suits, or jammers. Male suits may not extend below the knee. If you have to ask, it’s probably not allowed. Swim aids of any type are prohibited. You may wear a swim suit (as outlined above), one silicone or latex swim cap, ear plugs, and goggles. Simple wrist watches are allowed. No other type of navigational devices or GPS devices/watches/etc. are allowed. Loop direction is at the discretion of the race directors and may be changed at any time. Swimmers must stop at the two race course buoys to collect a token before they can be checked in as officially completing a loop. Failure to procure both tokens will disqualify a swimmer from continuing the race. Swimmers may not accept any aid from spectators, race volunteers, or officials during their swim loop. Accepting any type of aid means forfeiting your loop. In the event of lightning or inclement weather, race volunteers will alert the swimmers. At their own discretion, swimmers may then either exit the water during their loop or continue swimming. If you choose to exit the water, you may not make any forward progress. The clock does not stop if you exit the water, so if you choose to exit the water, you must complete your loop and be ready for the next loop at :59 on the hour. During inclement weather, for the safety of both kayakers and swimmers, all kayakers will be instructed to exit the water. During this time, swimmers will not have kayak support and should they decide to continue swimming, they may do so solely at their own risk. There will be race volunteers placed at a few points on shore along the course. They are there if you require assistance or need to stop in the middle of your loop, however, if you exit the water for any reason other than for inclement weather or accept assistance from volunteer crews, you will be disqualified. We will have a few roaming kayaks during the race. They are not there to assist you unless it’s an emergency. They will not guide you if you get off course. They will not hold feeds for you. However, if you have an emergency and want to quit, they will be available to help you exit the water safely. One crewmember must be available for volunteer duties, as assigned by the Race Directors. This could be kayaking, making coffee, boiling water, stocking the fire, etc. If your team refuses to help as needed, the swimmer may be disqualified. Race directors have the discretion to change the rules at the start of each loop. You are not allowed to complain. If we reach 6:59 pm on Sunday with more than one racer, the race directors will implement a race-off. We have an online application this year, with credit card payment options! YAY! Race Directors have the right to refuse/deny an application to this event if we feel you are not qualified. Please include as much of your swim history as you think is pertinent on the application, particularly your cold water and altitude experience. We will notify you if your application has been accepted. If you are not accepted, we will refund your race fee, minus credit card fees. This event will be capped at 30 swimmers and they will be notified by June 15. After 30 participants, we will start a waitlist, in the event that a participant drops out and another is qualified. We will notify a waitlist applicant that they may have the opportunity to fill the empty slot. Refunds will not be available if you cancel/change your plans. Application deadline is May 31 at 11:59 PM. Late applications may be accepted on a case-by-case basis. $500 application fee does not include a 6.5% surcharge, which will be applied at checkout to cover costs for the credit card hosting and registration company-GetMeRegistered. Also does not include a $1.50 refund fee charged by Get Me Registered. Applicants will therefore be refunded $498.50 of their original registration costs, if their application is declined. This is an outdoor, open water event. Things can happen that mean the event may be cancelled. There is no option for an alternate weekend. We’ll do our best to hold the event no matter what, but please know that race fees are non-refundable. This is meant to be a self-supported event. We’re providing the location and basic amenities, but you are on your own for everything else. Please plan accordingly.